Daily Spirit & Word: 720: Living The Jesus Way. Philippians 2:1-8 (NIV) If you have any encouragement from being united with Christ, if any comfort from his love, if any fellowship with the Spirit, if any tenderness and compassion, then make my joy complete by being like-minded, having the same love, being one in spirit and purpose. Your attitude should be the same as that of Christ Jesus: Who, being in very nature God, did not consider equality with God something to be grasped, but made himself nothing, taking the very nature of a servant, being made in human likeness. And being found in appearance as a man, he humbled himself and became obedient to death—even death on a cross! Doing NOTHING out of selfish ambition or vein conceit. Considering OTHERS better than ourselves. Not ONLY thinking or looking out for ourselves, but also the interests of others. i.e. we are to look after ourselves as well, but ALSO others. 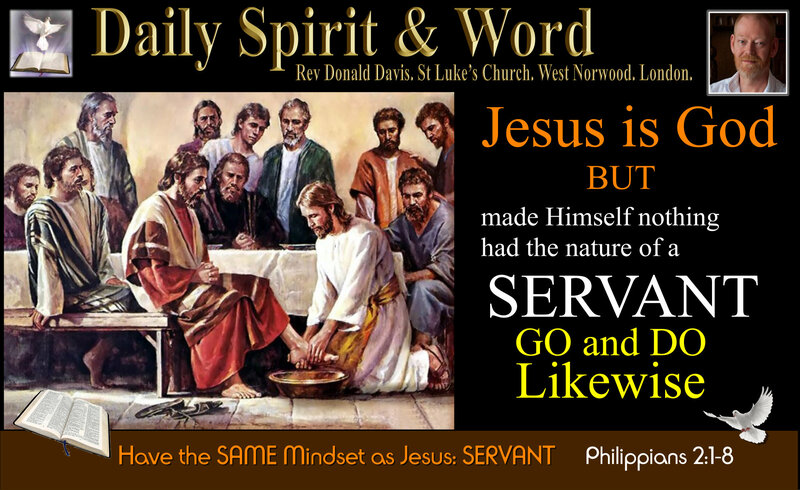 Having the ATTITUDE OF JESUS: The Nature of a Servant: i.e. how can we SERVE: God and Others. So much of what we call ‘Church’ these days is all about ME rather than the Jesus ways we’re meant to emulate, copy and model. Are these the thoughts of a self-sacrificing servant? Perhaps the majority liked that song. Perhaps that Sermon spoke to someone on their way to faith in Jesus. Perhaps God’s bringing someone to church that day, that only YOU can reach by welcoming them. Perhaps you make tea in just the way that a first time visitor really likes. Perhaps you’ve got just the message or personality that a child can relate to. When we’ve got the SAME MINDSET as Jesus, we’ll not be thinking primarily about what BEST FOR ME or What I LIKE or Prefer, but how we can SERVE both God and Others in such a way that the whole body of Christ can be UNITED, built-up, strengthened, encouraged and brought even closer to the Lord than they’ve ever been before. So this coming Sunday, come to worship the Lord Jesus with His ATTITUDE and MINDSET. It might be something SMALL to you, but it could be the most significant EXPERIENCE of genuine love that someone needed at just that moment in their life. Your hands, your feet, your mouth can be used to serve Jesus every day. Not just in Church gatherings. How can you SERVE like Jesus at home, work, family and in the community? When people see you every day, do they KNOW you are a follower of Jesus because of your MINDSET of Jesus? Is your ATTITUDE the same as that of Jesus with people outside fellowship? PRAYER: O Lord Jesus, as we get ready for PENTECOST again this year, and remember how you filled the first followers with Your Spirit, please so fill me with your Holy Spirit today, that I may be more like Peter was on that day, help me Lord to think less of myself and my likes or dislikes and think about You and others and how I can serve them in such a way that their lives will be transformed and set of fire with love for You. Help me to be SALT and LIGHT that brings JOY to You and Others. Amen! It’s my wife’s birthday today, Lord help me to make it SPECIAL for her. Amen! 4 so he got up from the meal, took off his outer clothing, and wrapped a towel round his waist. 5 After that, he poured water into a basin and began to wash his disciples’ feet, drying them with the towel that was wrapped round him. 13 “You call me ‘Teacher’ and ‘Lord’, and rightly so, for that is what I am. Next PostNext When Temptation Rears It’s Ugly Head.